A half full dixie cup is not the only way to check your head position during backstroke rotation drills. You can use goggles or even stacks of loose change. I’ve been known to bring $10 rolls of quarters to practice and challenging the kids with some friendly rotation drill competitions: they get knocked out if their quarters fall off their head and have to add a quarter after each successful 25 until we have a winner. Notice that my shoulders are dry and I’m in a nice, straight line. My shoulders rotate around my very still, and relaxed head. Backstroke Rotation Drills are a great way to work on your long axis rotation while keeping your head still. Rotation drills will help both your backstroke and freestyle. 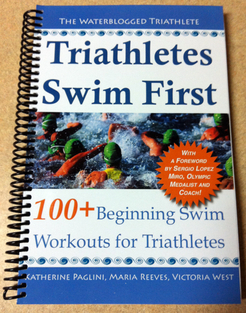 At a minimum, we believe triathletes should be able to swim both backstroke and freestyle. When doing backstroke rotation drills, you don’t need to use tools to check your head position, but I like using tools because the feedback is immediate. It also makes it very easy to see if you’re rotation is better on one side than the other. It is up to you if you want to wear fins during this drill. Fill the dixie cup to the halfway point and gently push off the wall on your back with your hands at your side (one hand holding the cup). Balance the dixie cup on the center of your forehead. Kick on your back to make sure the cup is balanced. Once you are ready, rotate to your side so that your arm is dry. Do six kicks. Rotate to the opposite side so that the other arm is dry. Do six more kicks and repeat. You want to have a steady, even rotation on both sides. Does the cup fall off when you rotate to your left but stay on when you’re on your right? If it does, you need to work on that. A good rotation will help you have long, smooth strokes in backstroke and freestyle. Keep your head back and pick a point in the ceiling to focus on. If your’e practicing outdoors, you won’t have that luxury and it will be more difficult to swim in a straight line. Do a 25 with the cup on your head without rotating at all. i.e. flat on your back. Do a 25 with the cup on your head on your right side. Do a 25 with the cup on your head on your left side. Do a 25 with the cup on your head where you rotate six kicks on your right/ middle/ left/ middle. Do two 25’s with the cup on your head where you continuously rotate six kicks on your right and left side. When you feel ready, try isolating your right and left arms with the cup on your head and building to full stroke backstroke. I’ll post more on this soon. Gotta add this to my backstroke drills day!!! Looks tough! That is awesome! Thank you so much for that post! I’m so glad this drill helped so much!!! Backstroke, check!